I went to the Commodore Theater in Portsmouth Virginia tonight to see the movie Star Trek. Great movie! 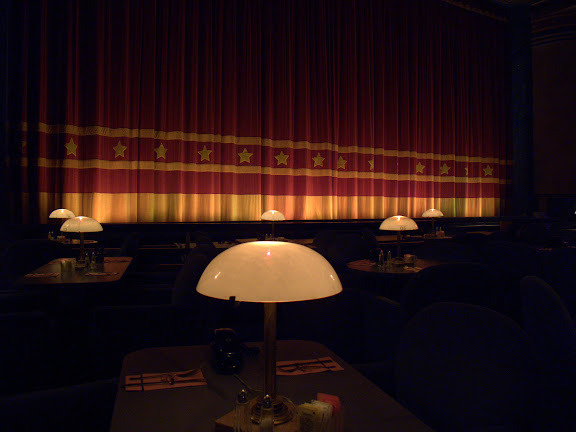 The Commodore is a classic 1940's Art Deco theater that has been restored and shows current first run movies. This photo was taken from our table looking towards the curtain clad screen. What a way to see a movie, big screen, THX sound and lots of elbow room. Canon G10, 1/3 sec @ f/3.5, ISO 200, 11mm equivalent focal length. Camera sitting on a rail triggered with the self-timer.